Choose the design of our turn indicator that looks best on your bike. We provide selected and proven motorbike LED indicators adapted to 6 V.
Controllers and indicators can be mounted on your bike in several ways. We'll provide different brackets. Once assembled just go. The hub dynamo charges the battery, that's what it's for. Charge the battery at the USB port. A fully charged battery lasts for several weeks. The battery is commercially available and replaceable. 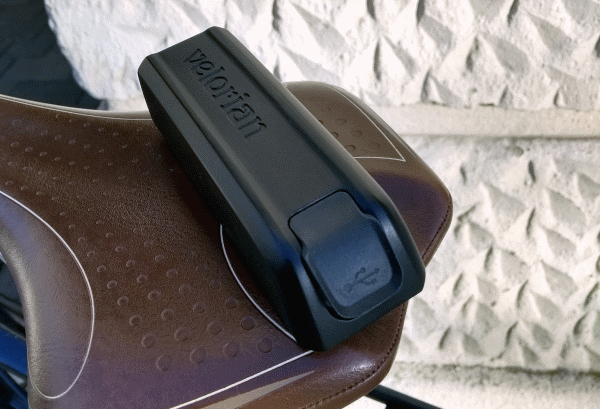 Choose the indicator switch that suits best to the other controls on your handlebar. The controllers and indicators are fixed as safe as anything else on your bike. No need to carry around the equipment. Today we want to get away from the traffic in the big cities and its negative consequences for the environment and the residents. The bike it is. Especially the change from car to bicycle. Those drivers are familiar with the traffic rules, they do not drive on the sidewalk but rather use for example the left turning lane at intersections. Especially with a cargo bike they do go on the street. Probably they would like to flash there again, like with a car, to make everybody else understand why they are there and where they want to go. Anyone who has tried to give a hand signal on uneven roads or had to wait at traffic lights may have thought about turn signals on bikes. Many have done so in the past and some results can be found in the patent office databases. Whether mechanical winkers or electric lights, they failed due to the effort that the driver had to spend on their use or failed while providing the energy over large lead batteries or their energy supply with side rotor dynamos. Those days are gone. 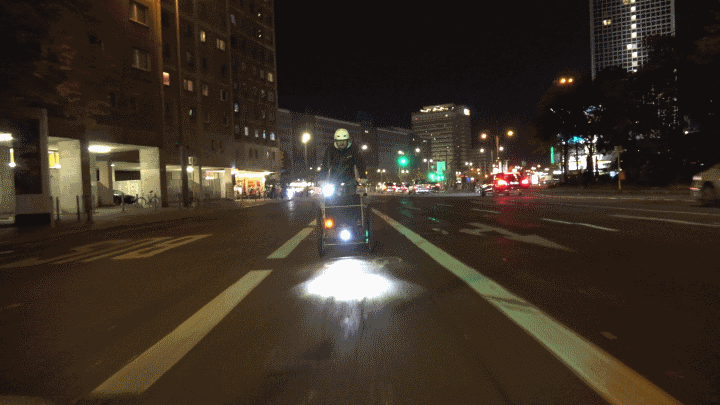 Obviously turning signals as well as bicycle lights can be energized by built-in batteries in case separate check and charging process for front and rear light, front and rear indicators and turn signal switch are acceptable. Such option may be sufficient for sports and occasional applications in fine weather. But for commercial applications or for general daily use of the bicycle it can't be acceptable. Then a hub dynamo is a start. 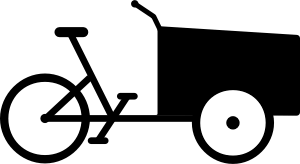 In addition a battery is favored which can be loaded over the hub dynamo. Such battery could also supply energy at traffic lights when waiting time is long again. In addition it could be able to provide energy for the bicycle lights for weeks when charged at electric sockets. Such solutions is feasible when cables are fixed once on the bike frame. They run from the hub dynamo to the control unit, from there to switch and turn signals. Nobody wants a lot of cables on the bike or a wiring harness. Therefore multi-core cables are used which are not thicker than a Bowden cable. Nowadays cables can be so thin because the LED technology in the turn signals meanwhile consumes less power than for the bulbs of earlier turn signals generations. The plug connections are integrated into the solution and protected against weather influences. This design ensures low maintenance efforts and together with the technical parameters it meets the UN/ECE vehicles regulation No 50. Each bike frame looks different. With its geometry it sometimes offers less space for accessories. 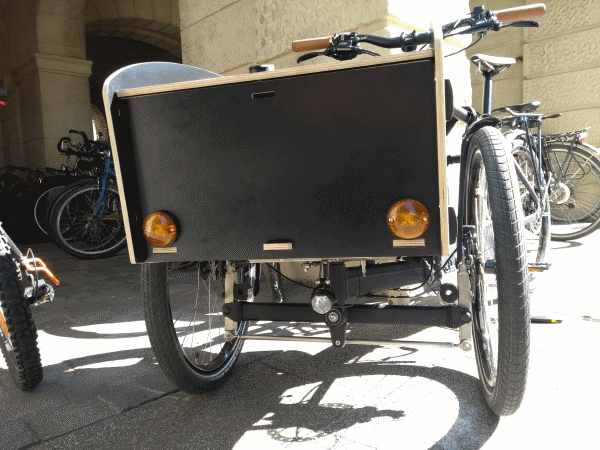 With cargo bikes it even looks very different. That's why the control unit for our turn signal solution is as big as necessary and as small as possible. It can easily be attached to the frame with the appropriate cable ties where it fits best with the other accessories. Additionally the bottom is equipped with anti-slip coating. So the control unit will not slip. The situation with the turn signals is alike. 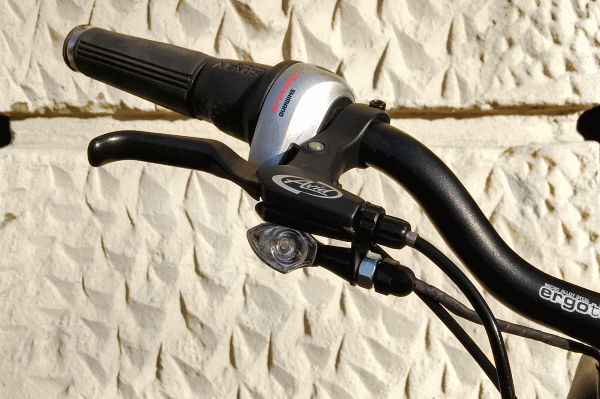 Which turn signals can be used depend on the bike. There need to be 6V LED turn signals with our solution. Turn lights must be yellow. Headlight must be white, brake and tail light must be red. Turn lights as described we do offer. It was important to us to integrate the connectors of the cables into the housing. 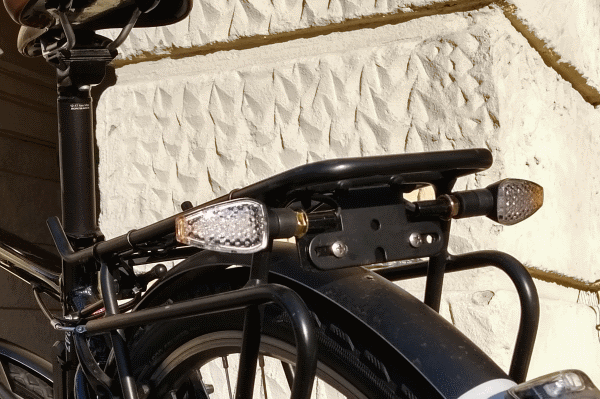 We also have developed a separate housing for the cable connections on the handlebar. Ideally, a hub dynamo supplies the renewable energy. The hub dynamo charges the battery. Since hub dynamo, control unit, turn signals and switches are wired with each other, only one battery is sufficient. As with a motorcycle. Of course the battery is interchangeable because even high-performance lithium-ion batteries do not last forever. If you own a bike with a hub dynamo, after a winter break, you simply start driving. Your empty battery is charged on the trip. While driving, the turn signals work even when the battery is flat. This is ensured by the hub dynamo. As soon as the battery is full enough, turn signals work again for the traffic light stop. 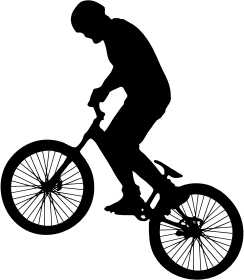 Anyone who has no hub dynamo on his bike or does not want to have one, can easily remove the controller and charge it with a standard USB charger such as for a cell phone. One charge will last for several weeks. An LED indicates when it is time to recharge the battery. Additionally the controller can be secured with a small screw. 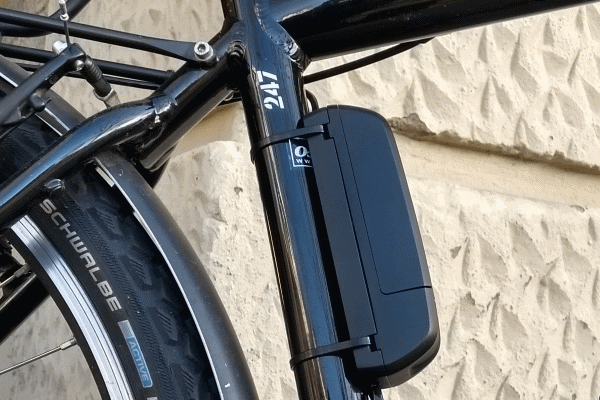 Anyone driving an e-bike already benefits from the advantage that the already existing battery provides the required power. So, only a more tiny controller is needed. This one can ideally be mounted within the frame. 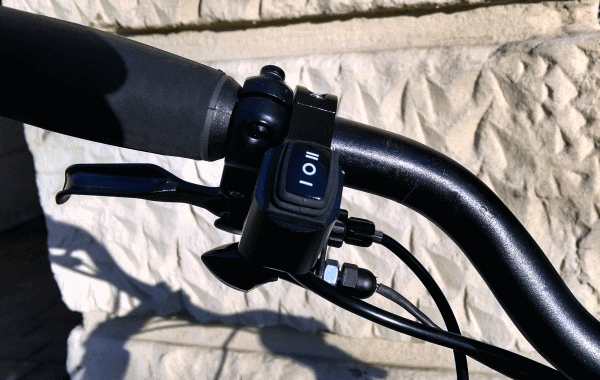 The developments around the subject of e-bike have already generated a lot of suitable switches. Anyone who likes it more solid will find a suitable switch in the field of motorcycles. Any on-off-on switch is fine. It's about togetherness in traffic. This includes that flashers should be recognized as such. One option is to use turn signals that have the appropriate approval like 6V mini LED turn signals for motorbikes. These are fixed with stable brackets at front and rear of the bike. 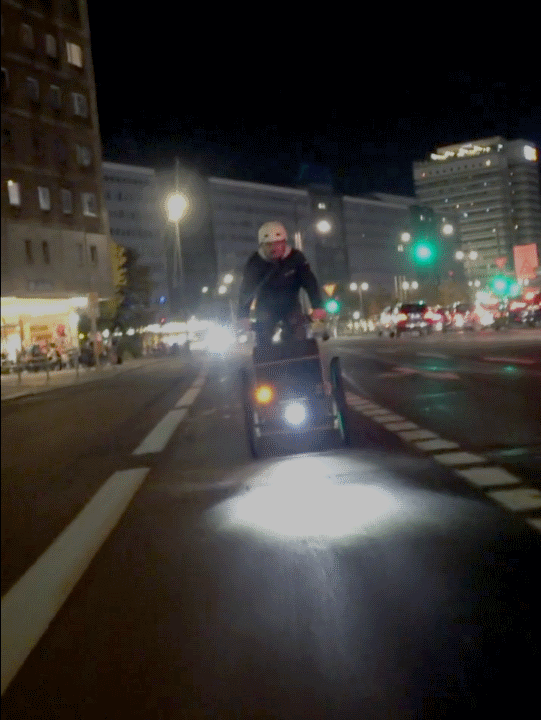 It's also about arranging the turn signals together with the existing lighting on the bike. Flashing headlights and taillights in combination with turn signals do lead to bring more confusion than benefit. Flashing headlights and taillights are even not permitted in Germany's road traffic. And turn signals without the context of a headlight or taillight in the dark are just flashing lights. Front or back, left or right are then no longer recognizable. The control unit ensures that the turn signals flash at the prescribed frequency. It also ensures that e.g. the red front light flashes at double speed in case the left rear light is broken. For the type of battery no special kind but standard size was chosen, to make customers able to bye a replacement at the nearest dealer. Enter your email address, check he left box to confirm to receive the newsletter and send with the right button. We send a confirmation email. In this and any following email you can remove your address from our database by unsubscribing via the provided link. Name, address or email address will only be recorded in the context of the respective use, such as a newsletter or an order, and only passed on to authorized third parties in the case of legal requirements. In order to avoid someone receiving undesired information, you must first confirm your email address when subscribing to the newsletter. This means that the subscription will not be activated until you click on the link in an email that we will send to the indicated address. You can at any time delete your email by using the link provided in any mail we send. We don't collect and analyze information of visitors on our websites, e.g. IP addresses or clicks. Data entered into forms is encrypted when transmitted to the server. You will recognize that your data is transmitted via a secure connection by the "https" instead of "http" in the address bar. As a manufacturer we are aware of the opportunities and responsibilities that we have on the growing garbage dump. 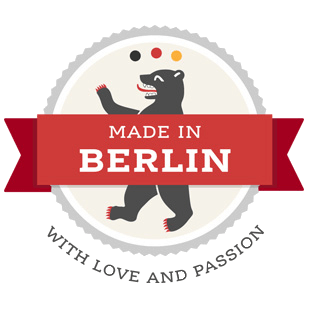 Wherever possible our products are made from recycled or natural raw materials. Packaging is free of plastic materials. We also work with our suppliers to reduce plastic waste. Why this? Because we cannot go on polluting the planet with disposible plastic. Check out these websites for more information.